WinADay Casino's mobile casino is now more tappable and swipeable! If you like to play on your smartphone or tablet, get a $15 freebie this week to take it for a spin! There's also a bunch of other mobile casino deposit bonuses to give you some extra mobile casino play time. The majority of WinADay’s unique games are available in the mobile casino – penny slots, premium slots, and video poker, including the newest WinADay game Magic Spells. 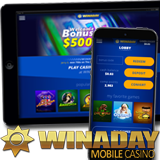 You can access the mobile casino games in the Safari or Chrome browser on your smartphone or tablet by entering the regular WinADay URL: www.winadaycasino.eu. Magic Spells is a new penny slot with Expanded Wilds and a Pick Me bonus game that awards instant cash prizes. Potions, magic wands, witch’s hats and spell books spin on the reels of this 5X4 slot where players can bet as little as $.20 or a max bet of $5 per spin. $15 freebie to try mobile casino games available until February 5th, 2017. Valid for any mobile slots; available once only. Valid for any mobile video poker games; up 3X/day. All Mobile Casino Bonuses are available January 30 – February 5, 2017 only.